With the 4th of July holiday hitting 2013 on a Thursday, it broke the week up into two. It also meant Scott and Lee were vacationing with the families this week leaving us without a rhythm section. Alan was also unable to make the jam. Fortunately, we were able to call in one of our subs, in the form of Bill Sloan. Sometimes he plays bass sometimes he plays drums. This week he was behind the drum kit holding down the fort by himself. With Bill came a new keyboardist to Deadstein in tow named Scott. He brought his B3 sounding keyboard to the jam and plugged it into one of the Fender Twin Reverbs and we had B3 sounds from him all night long. Scott seemed to be into the New Orleans music scene more so than the music of Jerry Garcia and the Grateful Dead and therefore seemed to have a strong penchant to the Aiko and Hey Pocky Way that we did. Since we were playing on July 3, the day before a vacation day for all us, we seemed to be a bit more relaxed than usual, not having to worry about getting up for work in the morning. This meant we had a late start, just after 8:30, a long break and a later than usual quitting time of around 12:25. It also meant that Donna was with us for the entire jam instead of her usual, one set and out. Instead commemorating the 4th of July holiday with the predictable salutes to patriotic like US Blues, Liberty, etc. we decided to pay tribute to the 4th of July by playing some of the songs written in 7/4 time. This included the Uncle John’s Band jam, Estimated Prophet and our venture into Pink Floyd’s wallet with Deadstein’s version of Money. We had played the Breathe, Time, Breathe reprise from Dark Side of the Moon last week as a lark, but after practicing it at home this week, I was ready to give it a second attempt. Our Pink Floyd cycle this week included heading over to the Great Gig in the Sky where Donna let loose some fireworks and belted out a strong rendition bringing the music almost to a halt. We had do our best just to keep playing music to support her as she whaled across the Great Gig in the Sky. The other elements to this Pink part of the night were also fun as the Breathe, Time combo were a big improvement over last week’s efforts and the Money was another great song, in 7/4, from which Deadstein may derive some fun into the future. 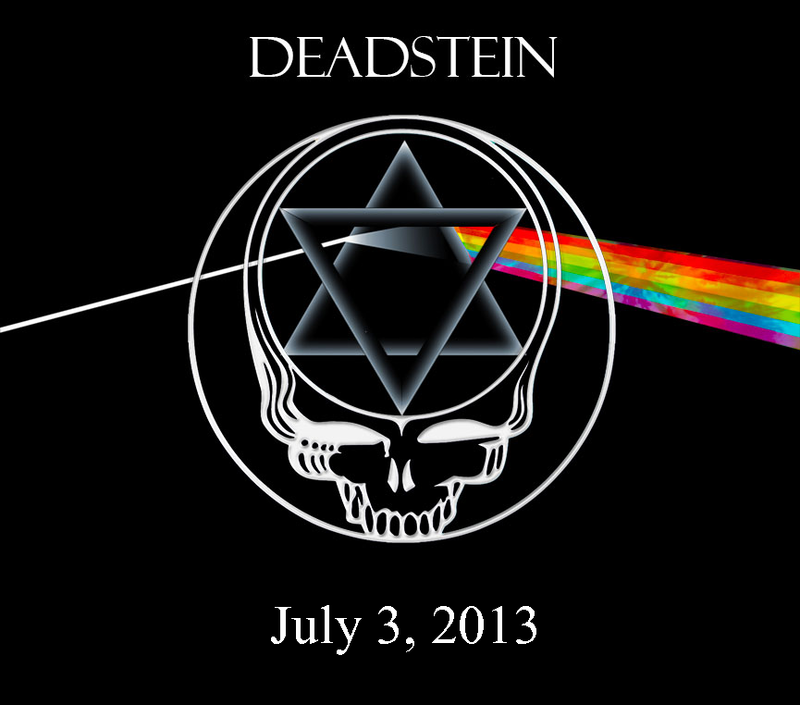 This music has a lot of the Dark Star elemental type of sounds associated with it and may provide a vehicle for Deadstein to shuttle to the Dark Side of the Moon where you can sense but no see a Dark Star. As far as guests, we had our two guests musicians, Scott and Bill as previously mentioned. Additionally, Steve also showed for half the night and some of Rich’s neighbors, Paul, Sheila and a clogger whose name I forgot, also seemed to get a kick out of our music. Donna also belted out a Positively 4th Street followed by a Music Never Stopped to close the first set. Donna had two good “Donna” moments in that one. We then did a nice Uncle John’s into Gimme Some Lovin and back into Uncle John’s combo. I thought we would take advantage of the presence of organ in the room and play the Gimme Some Lovin. We got back into more of that Cajun sound with the Aiko and went right back to the good ols USA celebrating 7/4 with an Estimated into a New Speedway Boogie to close out Donna’s night. We needed a closer to cap off the evening, but we were already 15 minutes over time. Thank the lord we didn’t have to work the next morning so we took the opportunity to close with some gusto. The Feel Like a Stranger fit the bill and we played purposefully and concisely during the Stranger. We were playing as if it was the last song of the night on a night when we want to go one further. With the final notes of the Stranger hitting, it brought another freakin’ evening of Deadstein to a close. So until we freak again, freak out!